3Flow offers a combination of services, products and training for systemwide airflow management throughout an entire facility, starting with the needs of the Critical Workspace. Our approach improves safety, reduces waste and facilitates success. It also reduces ongoing maintenance costs. The core concepts of our system are the dynamic modulation of airflow and demand-based optimization. We ensure the right amount of airflow is available in the right place, at the right time, starting with the risk-based needs of the Critical WorkspacesExamples of Critical Workspaces include research labs, medical testing labs, clean rooms, and operating theaters. at the heart of your organization. There are many other companies offering services related to airflow, from ventilation contractors to product focused vendors. However, only 3Flow combines a deep understanding of Critical WorkspacesExamples of Critical Workspaces include research labs, medical testing labs, clean rooms, and operating theaters. with 25 years of history as an objective advisor delivering optimized airflow solutions. 3Flow is the world leader in the systemic analysis, design and testing of optimal airflow systems for critical and mixed use facilities. We have tested more than 10,000 Critical Airflow Systems, improved safety in world class facilities, and saved our customers millions of dollars in reduced energy usage. We offer a blend of services and products in three broad categories: Performance Optimization, Ongoing Performance Management, and Training. Performance Optimization begins with the measurement and analysis of existing systems. This includes a detailed risk assessment for every Critical WorkspaceExamples of Critical Workspaces include research labs, medical testing labs, clean rooms, and operating theaters. in your facility. The collected data is used to create a set of performance and operating specifications, and a Statement of Work. Post implementation, 3Flow creates a Critical Workspace Airflow Management Plan (AMP) and a personnel training plan. When 3Flow was founded in 1994, the company was called Exposure Control Technologies (ECT). Our primary business was testing fumehoods and related airflow control systems. We’ve tested thousands of airflow control systems and components. We continue to test new products as the are released. If you are a manufacturer and would like to have your product tested, please Contact Us. 3Flow also has an active R&D program. We often find opportunities to solve problems with new and novel products. 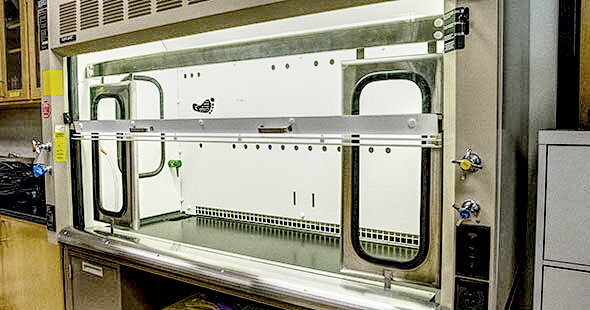 One example is our Fumehood Retrofit kit, which will improve safety and reduce waste in existing facilities. The work doesn’t stop once an airflow system is fully optimized. Based on decades of rigorous testing, we know that airflow systems lose up to 50% of their air moving ability within 5 years. Ongoing performance management is critical. We regularly test all systems and monitor overall system performance on an ongoing basis. 3Flow can also provide a variety of routine reporting to ensure all stakeholders are kept informed. The Performance Optimization phase ends with the creation and implementation of an Airflow Management Plan (AMP) and a personnel training plan. As needs and demands change, the Airflow Management Plan must be updated. Equally important, regular training must be provided to existing and new team members to ensure the safe operation of your Critical WorkspacesExamples of Critical Workspace include research labs, medical testing labs, clean rooms, and operating theaters..